No need to spend hours Googling for the prefect math sites for your students. 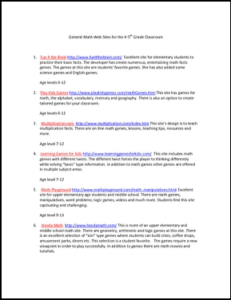 This document contains math websites that are excellent for the elementary school class. Descriptions and ages levels are provided for each site on the list. The links take the user to multiple math games to practice math skills. Additionally links are provided to virtual manipulatives and math dictionaries. There are over 25 links provide in this resource. ← Shakespeare’s-A Midsummer Night’s Dream-Unit BUNDLE! Digital & Printable!